Elizabeth Blackwell - Can You Be Stopped ? In 1849, Elizabeth Blackwell became the first woman to receive a medical degree in the United States. The English-born physician opened the field for other women while founding important medical institutions such as the New York Infirmary for Women and Children in 1857, and the National Health Society in 1871. Born in England, Blackwell emigrated with her family to the United States in 1832, and lived in New York City. Privately tutored both in England and in America, she began her professional career as a teacher to aid her family economically after her father's death. At the time Blackwell decided on a medical career, there were no academically trained female physicians in the United States, making her acceptance to medical school unlikely. Admission to medical school also required previous experience, which as a schoolteacher, Blackwell did not have. Undeterred, she used her teaching skills to her advantage, moving to Asheville, North Carolina, to be a music teacher for the daughters of Dr. John Dickenson. There, Blackwell bolstered her medical résumé through his tutelage, and by observing his practice and using his medical library. The admission of a female student into an American medical school was unprecedented. Some doctors Blackwell knew encouraged her to apply as a man, while others discouraged her altogether. She was rejected by almost all of nearly thirty schools to which she applied. She was accepted at Geneva Medical College in Geneva, New York where she began her studies in 1847. Despite being snubbed by the local community, referred to by the dean of faculty as an "inconvenience" to male students, and asked not to attend lectures on the male reproductive system, Blackwell persevered. She excelled in all of her studies, from anatomy to material medica, or the study of the origin, preparation, dosage, and administration of drugs. In January 1849, Blackwell graduated first in her class, after which the college closed its doors to women. Blackwell soon became an advocate and lecturer for the benefits of preventative medicine and physical hygiene. At the same time, she urged other women to pursue medical careers and pushed to make medical education available to more women. In order to address her biggest concerns—improving access to medical care and providing a place for women to work in the medical field—Blackwell founded the New York Infirmary for Indigent Women and Children in 1857, which still exists as part of the New York University Downtown Hospital. Although she preferred that women study alongside men in the same medical schools, Blackwell realized the obstacles to co-ed education. In 1868, she established the Woman's Medical College of the New York Infirmary and served as its professor of hygiene. In 1869, Blackwell returned to England, where she continued her medical advocacy. Leaving her sister to run the infirmary and college, Blackwell lived out the remainder of her life in England, continuing her work as a lecturer and advocate for medical causes. She published her autobiography, Pioneer Work in Opening the Medical Profession to Women, in 1895. 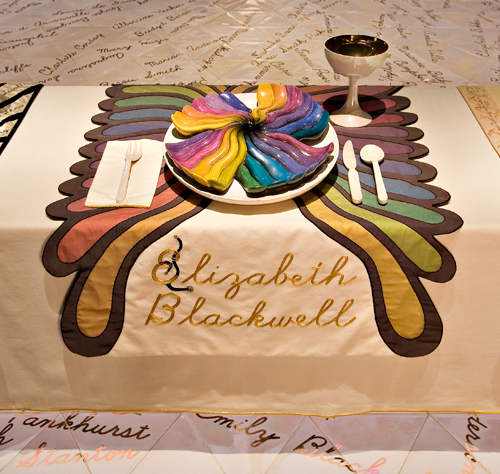 Elizabeth Blackwell's place setting is a metaphor for both her triumphs and her difficulties in the field of medicine. The plate is comprised of twisting, brightly colored forms that swirl toward a central "black well," a visual pun on the doctor's name. Like the new opportunities for women that arose out of Blackwell's efforts, the plate's curling color bands seem to be lifting off and growing out of their base. The plate's bright palette is repeated through the rainbow colors of the runner, an abstract butterfly shape with scalloped edges resembling wings. The butterfly is a symbol repeatedly used in The Dinner Party to represent women's freedom. In this setting, it can be interpreted as a celebration of Blackwell's landmark achievements in medicine. The swirling motion depicted in the plate and runner also symbolizes the shift in thinking that allowed for more opportunities for women. The brilliant colors of the runner, however, are veiled in a thin gray chiffon, suggesting the difficulties Blackwell and other women pursuing careers in male-dominated fields still had to endure. The technique used to create the runner's form, reversed appliqué, or the cutting away of layers of fabric, is also a metaphor for the "obstacles faced by women wishing to break into various professions" (Chicago, The Dinner Party, 131).